After... some time. 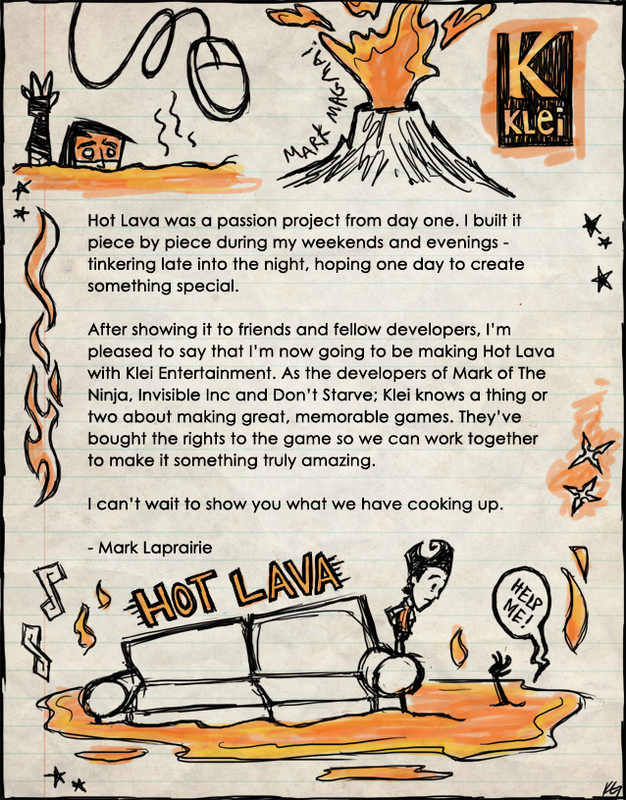 Hot Lava is now available for purchase on Steam as an Open Beta. A big thank you to everyone who helped push this game forward. We couldn't have done this without you. Hot Lava transports you back to your childhood imagination. Relive those moments of excitement, joy and chaos. Traverse fifty levels across five distinct worlds, from school hallways to the memories of your darkest fears. This is a game of dexterity and ingenuity, you will have to use all your skills to complete the treacherous obstacles that await. Run, crouch, jump and walk across tight ropes, platforms and traps. Hot Lava has straightforward controls, but beating the levels is anything but simple. With five distinct worlds to explore, you will find yourself reliving many moments from your own childhood. Furniture is piled high in the living rooms, schools and offices. The cold of the ice world stings your face as you try to escape, and shadows and deep rumblings entomb you in the underworld. One false move and you will wind up in the Lava, or crushed against a wall. Giant saw blades and meat grinders are just some of the many frightening hazards you will face. Timing is key to avoiding danger, so plan your route through the level and execute it flawlessly. Many surfaces in Hot Lava are frictionless, allowing you to slide along them with ease. Like flying in a dream, you keep gaining momentum. You will have to master the skill of surfing if you want to beat the most challenging levels. How is the development going? Any updates? Please release an early access, Cannot wait for this game. Hey, need help with knowing more about the game. Then click here for a short rundown! Enjoy. Also sub if you guys like... it is short I know. But provides useful and also my own twist onto the game 'Hot Lava'! Hello, I present channel is YouTube and want to make your game on the video does not help with the key?